Are Organic Anti-Flea Shampoos Weaker? Does Oatmeal Shampoo Kill Parasites on a Dog's Coat? What is Precor and How Does It Work? How to Safely Use Dog Flea Shampoo? Fleas and ticks reproduce and spread quickly so eradicating them right away and in an definitive fashion is necessary. And for this, you need to buy a dog flea shampoo that is going to kill fleas and ticks on your dog’s coat, while preventing them from returning. 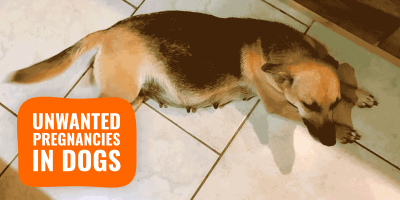 Flea shampoos for dogs are ideal for animals but you still need to clean the rest of your home. 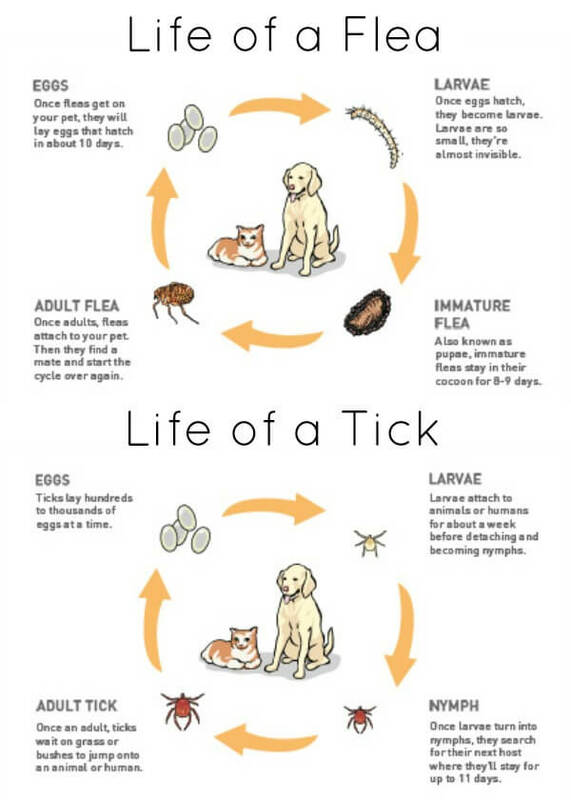 Getting rid of ticks and fleas requires an overall action: on your pet, in your home, on beddings, and in the yard. Dog flea shampoos can be used for cleaning your dog on a regular basis too, if your pet spends a lot of time outdoors. 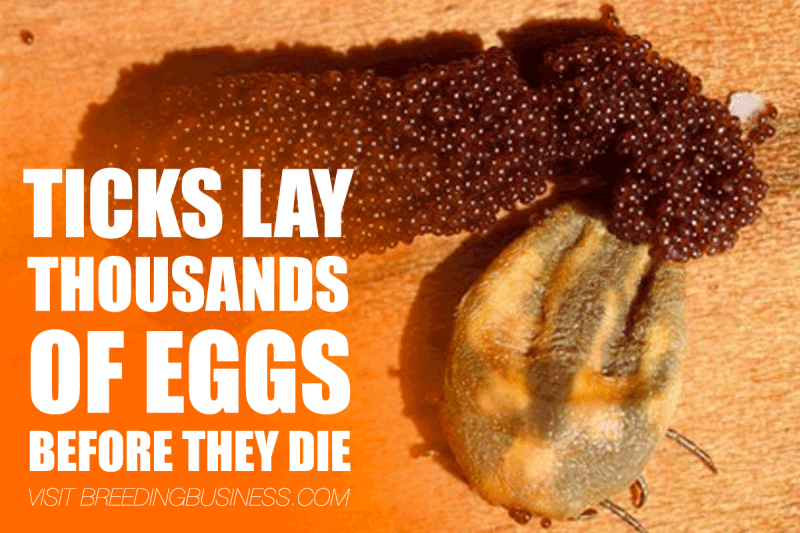 As a dog owner, you know ticks, lice and fleas are little parasites that ruin your life, and your dog’s one, too. They bite the skin of your pets, causing a great deal of discomfort and even passing on dangerous diseases. A single flea bite can leave the skin of your dog excessively itchy and irritated for days. For efficient cleaning, you need to buy a potent anti-flea shampoo! There is no way around this! 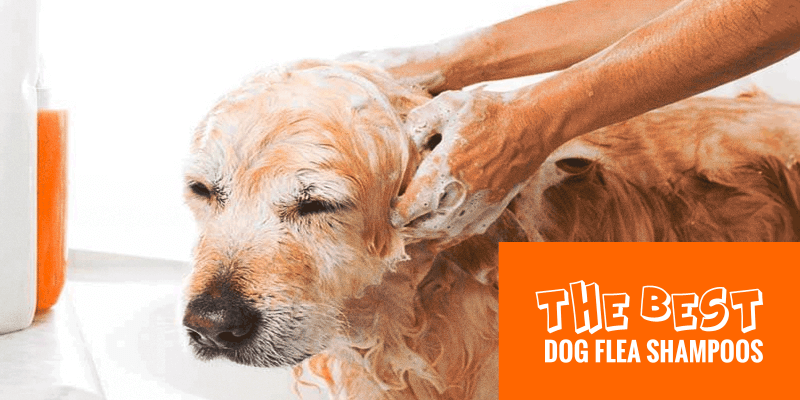 So here is our list of the top 5 best dog flea shampoos reviewed. There are also dog flea powders available if you dislike shampoos! The effectiveness of a dog flea shampoo will often depend on its suitability for your dog. As a dog owner, you should know about the ingredients, active compounds, nature and functions of the shampoos in order to be able to buy the best one. I understand we all want a quick fix but depending on how spread out the flea infestation is, you may need to use stronger anti-flea shampoos, for a longer period of time. Following are some of the points that are worth considering while buying dog flea shampoos. The primary and the most important purpose of a dog flea shampoo is to kill the fleas, lice and ticks from your dog’s skin and relieve him/her from the irritation, redness, and itch. The shampoo you choose should not only kill fleas but destroy the entire lifecycle of fleas so that there is no subsequent production of these. Some fleas and parasites in some geographical locations resist some products better, so it is kind of a game of trial and error. It is advisable to go for shampoos that keep away fleas for at least 28 days. Additional benefits must include odor neutralization, removing debris, and moisturizing the skin of your dog. Organic flea shampoos include essential oils like clove, peppermint and cedar, but also vinegar for example. These oils attack and repel fleas while also soothing your dog’s skin. However, organic shampoos are milder and hence, weaker than the chemical-based products. On the positive side, organic shampoos have very little or no side-effects! Overall, organic and natural dog flea shampoos are perfect preventative products but not suitable remedies for dogs who are prone to being affected by fleas or have been suffering from them for a long time. Using a dog flea shampoo is a start — make sure you clean your dog’s beddings, your home, and yard, too! Chemical dog flea shampoos commonly contain pyrethrins, which are basically natural extracts found in Chrysanthemum plants. All six kinds of Pyrethrins are used in shampoos nowadays. They disrupt the natural flow of sodium out of the nerve cells of the fleas, thereby killing the parasites almost instantly. 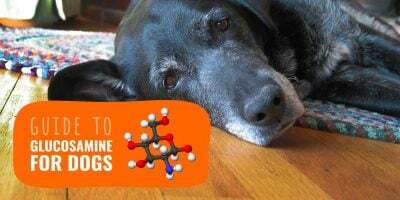 Though not very long-lasting in effect, pyrethrins work quickly in freeing your dog from the grip of fleas and ticks, especially during a sudden infestation. Check out for the proportion of this compound in the shampoo you buy and consult your veterinarian in case of any symptoms after use. Oatmeal is perfectly pH-balanced! And, oatmeal is a natural remedy for dogs with skins that are prone to itchiness and irritations. Oatmeal shampoos work well in ridding the parasites of their coats but the action is not very sudden; therefore requires the owner to wash his dog regularly, which in its own turns has some downsides. Natural oatmeal has a wonderful soothing effect on dog skin, relieving him immediately from skin allergies, itchiness, and infections. Apart from the dog flea shampoos with oatmeal content, oatmeal itself in its finely grounded form can be mixed with warm water for cleaning your dog’s skin every now and then. Precor, or Methoprene, is an insect growth regulator (IGR) used in dog flea shampoos for its effectiveness in killing fleas and many other parasites. Precor works by interfering with the life cycle of many parasites and prevents further spread and infestation by killing the larvae, too. The Precor content in dog flea shampoos prevents the fleas in the pre-adult stage from growing and spreading eventually, offering a more comprehensive and global action against fleas and ticks. Precor is a chemical and it is usually contained in a small proportion in the anti flea shampoos. It is, however, advisable to consult a vet before using a chemical-based shampoo to avoid adverse effects on your dog. However, the small quantities used in commercially available products online generally present no problems whatsoever. 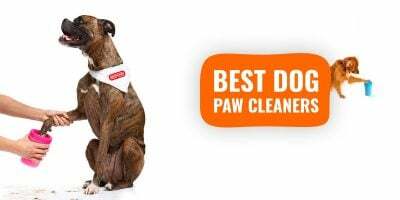 Herebelow are the reviews of the most efficient dog flea shampoos to ensure a victory over fleas, ticks, lices, and other parasites, squatting your dog’s coat, bedding, and your home. It matters very much to only use renowned anti-flea shampoos since they are mostly chemical-based, and using cheaply made products may cost you more in the long run. 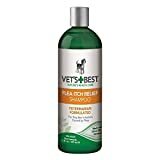 The Vet’s Best Flea Itch Relief Dog Shampoo is a veterinarian-formulated dog flea shampoo, recommended for puppies and dogs of 12 weeks and older. The key ingredients include micronized oatmeal, solvent-free orange and lemon peel oil, along with neem oil (a natural pesticide) that works well in soothing discomfort and itching as well as being very effective natural pesticides. The chemical content of this shampoo is very low, which ensures that your dog will never be adversely affected by this product. The Vet’s Best Flea Itch Relief Dog Shampoo also leaves a mild fragrance that further makes it loved and preferred by dog owners. 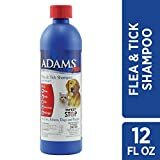 This anti flea shampoo for dogs almost instantly kills fleas and ticks, providing fast relief from flea bites and infestations. The Vet-Kem Ovitrol Plus stands out among the generally medicated flea shampoos by virtue of its 98% natural ingredients. Manufactured by a popular health brand, this shampoo contains Pyrethrin and Piperonyl Butoxide as active ingredients in less than 2% combined concentrations, making it very non-poisonous! The rest of the components include aloe, coconut extract, lanolin and oatmeal. The hydrating and conditioning properties prevent flaky skin, dandruff and itching while leaving your dog’s skin with a beautiful, mild fragrance. The shampoo not only kills the fleas and ticks but also interrupts their life cycle at the pre-adult stages, providing up to 28 days of flea control. The Vet-Kem Ovitrol Plus Shampoo can be one of your best picks as it effectively kills flea eggs, larvae and dormant pupae too that often re-emerge during the hot weathers. 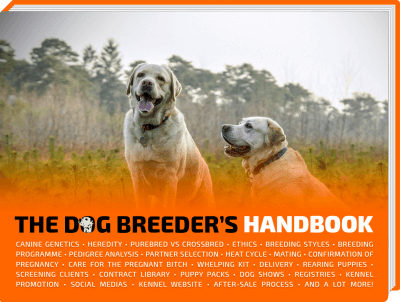 Go for this one if you want to provide the best of everything that is natural for your dog. 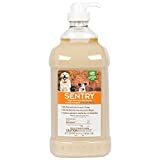 The Sentry Oatmeal Flea Shampoo for Pets is a specially formulated dog flea shampoo that immediately kills the fleas and ticks within a day or two of the wash and prevents them from returning for about 10 days at least. A once in a week use of this shampoo is recommended to eliminate the bugs and parasites in the most effective manner. A unique benefit is the addition of a Hawaiian ginger scent that your dog will simply fall in love with. This particular flea shampoo from Sentry contains Permethrin and Piperonyl, both of which act together and function as medication as well as insecticide in effectively eliminating lice heads, fleas and ticks, but also their nits or eggs. Oatmeal, present in fair proportion in this shampoo, works as a natural ingredient for removing dirt and odour from your dog’s skin, leaving the skin more hydrated. The shampoo is thick enough to make up a rich lather. A thorough rinsing with this shampoo instantly kills the fleas and ticks, leaving your dog’s coat smooth, shiny and soft. As with many other shampoos, this too, might not be too effective in getting away with a fully blown flea infestation. However, it’s certainly a good buy, ensuring prompt relief for your dog in case of mild parasite invasion. The Adams Plus Flea & Tick Shampoo With Precor includes soothing aloe, lanolin, coconut extract and oatmeal. It comes across as one of the best dog flea shampoos that you can consider buying right now. The best part of this particular shampoo is that it not only kills existing fleas but also targets the eggs and the pre-adult fleas. The Precor content of this shampoo prevents the pre-adult fleas from developing into adulthood. The aloe content, on the other hand, acts as a soothing agent calming the itch and irritation left by the fleas on your dog’s skin. The presence of pyrethrins in the ingredients indicates to the enhanced efficiency with which this shampoo can kill and repel the fleas. A nice lather with the Adams Plus Flea & Tick shampoo will leave your dog comfortable, remove the built-up dirt and at the same time, moisturize your dog’s sensitive skin. This particular dog flea shampoo keeps fleas and ticks away for 28 days. However, for dogs severely affected by fleas, this shampoo might not prove to be very effective from the first wash. It might not appear to be too helpful in preventing flea infestation. Also, it comes with an odour that stays for long and hence, might not be liked by a few. Overall, it’s one of the best in this category and therefore, a good buy for sure. It is generally the shampoo dog owners start with in the first place! The Hartz UltraGuard Rid Flea & Tick Shampoo for Dogs is one of the most popular and preferred dog flea control shampoos amongst exigent dog owners. This particular flea shampoo is suitable for puppies from six months of age, and older. Formulated with the mighty pyrethrins, it effectively kills disease carrying fleas and ticks and prevents them from coming back for a long time. The added oatmeal cleanses, deodorizes and soothes your pet’s irritated and affected skin. The fresh and light lingering fragrance of this shampoo ensures that your dog will simply love being cleaned and soothed by it. If your dog has long been suffering from the irritating fleas, regular bathing with this shampoo will hasten up the healing procedure. It is absolutely safe for your dog and does not cause any kind of stinging sensation even near the eye area. While the effectiveness of this shampoo in killing the infectious bugs is proven, certain ingredients in it might not be conducive to your dog’s skin, especially if he has specific allergic tendencies. This product might not be 100% satisfactory when it comes to preventing flea infestation, as observed by many users, some dogs will require a stronger product or more than a few washes with it to be satisfactory. Watch out for the two most avoidable ingredients namely, Organophosphate Insecticides (Ops) and Carbamates. These are classified as carcinogenic to humans, meaning they both have the potential to cause or increase the risk of cancer. Read the product label, instructions of use and the ingredients and find out the purpose and risk of each. Before trying a new brand or a new product, consult your vet especially if your dog is pregnant, old or already under some kind of medication. After the first-time use of a shampoo, monitor your dog for 24 hours after the bath and act immediately in case of observing any symptoms. Use the recommended amount only. Wash your hands and put on gloves while bathing your dog. Make sure that your dog is completely dried off after the bath. Brush his/her coat thoroughly with a comb while preparing him/her for the bath. Massage the shampoo gently and thoroughly on his body including the armpits, stomach, tail, groin area and paws. Just as your dog needs to be cleaned by high-quality dog flea shampoos, it is also equally necessary to keep the outside and the inside of your house parasite-free, cleaned, and disinfected. This will ensure that the fleas, after leaving your dog, don’t find a safe corner to rest until they attack your furry one again.